In the previous post I introduced the topic of this post by anticipating that it would be centred on the Atlanterhavsvegen and Kristiansund. 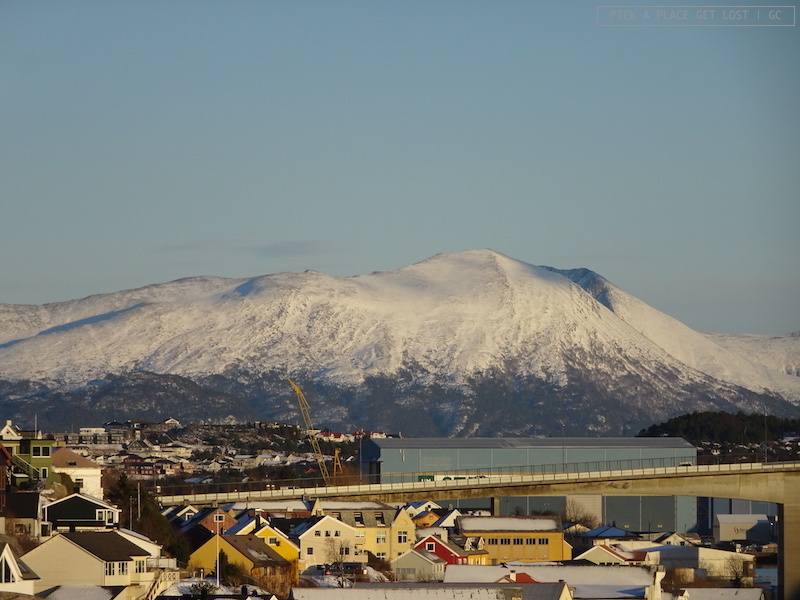 As I mentioned there, the Atlanterhavsvegen, or ‘Atlantic Road’, is one of Norway’s National Tourist Routes, i.e. eighteen highways the Norwegian Public Roads Administration has identified as especially unique for their scenery and infrastructure. 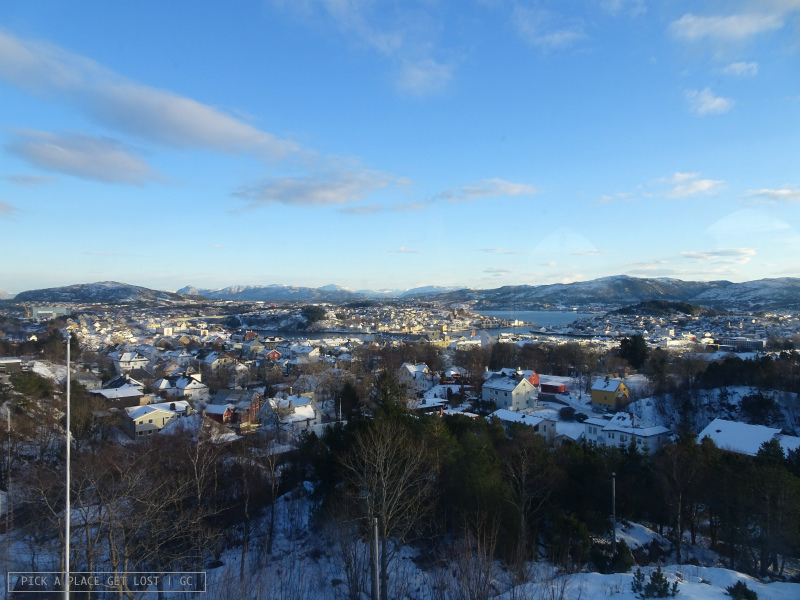 As for Kristiansund, it lies by a natural harbour overlooking the ocean, just north of Molde. 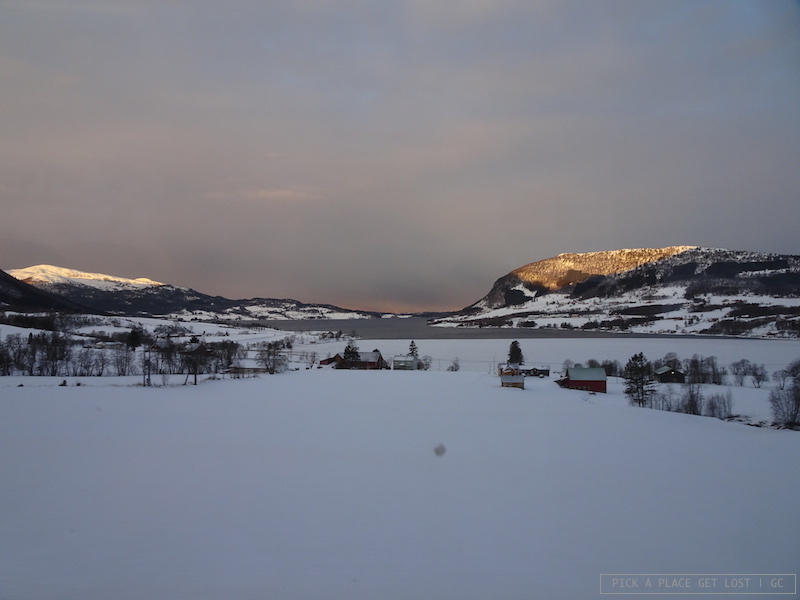 It is said to be one of the earliest Norwegian settlements. Its current appearance, largely consisting of brightly painted houses, is the result of the reconstruction that took place over the past 50 years or so, after the city was largely burnt to the ground by the 1940 Nazi bombing. 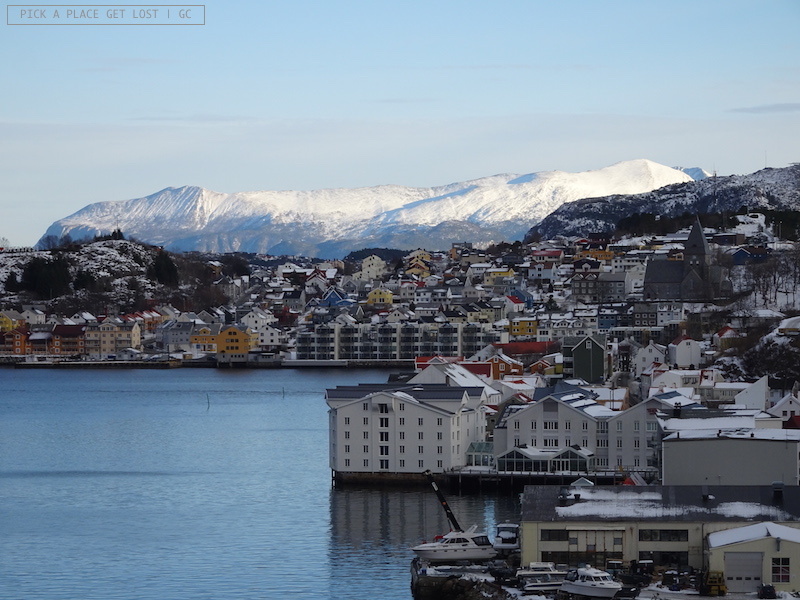 The city is mostly known for its harbour, ferry service, and fishing industry, especially dried and salted cod (or clipfish, klippfisk in Norwegian), which has been one of the city’s key export goods for centuries. 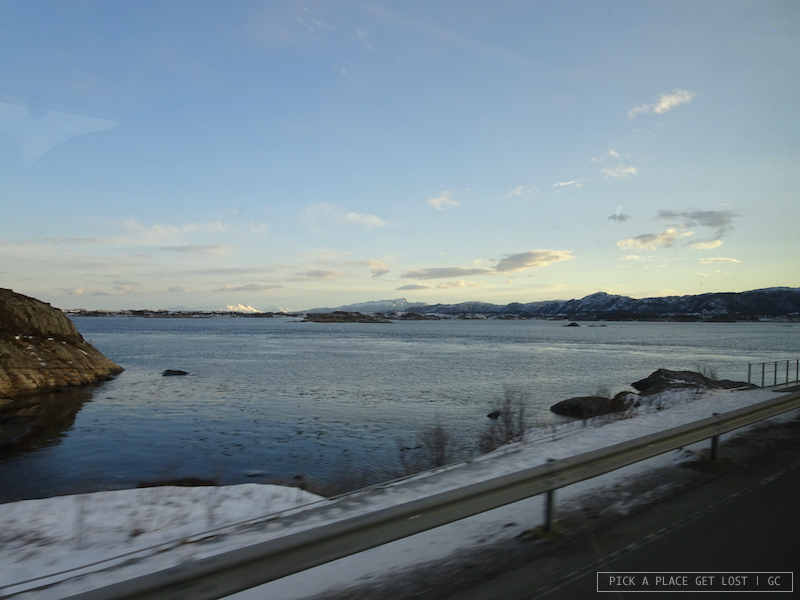 In order to experience the Atlantic Road and travel from Molde to Kristiansund, I booked one of the bus tours available on the website of Molde’s National transport company, FRAM. They offer a number of ticket combinations for the Atlantic Road and a few other destinations in the county of Møre og Romsdal. You choose the tour you’re interested in, a date and time, pay online, and that’s it. The one I picked is called ‘Round trip to the Norwegian scenic route Atlantic Road & Kristiansund’. Bear in mind that these tour options are nothing like the guided visits one might think of when one hears the word ‘tour’. There is no guide, no programme of the day, and no actual meeting point but for the bus stop itself. What you get when you make the purchase is a ticket for all the buses and/or ferries/boats you have to take in order to follow the itinerary of the specific tour you’re booked on. Aside from that, it’s all on you: you are expected to get on and off the bus at the right stop, as well as catch the right connection to continue the journey. Make sure you double check the bus timetable(s) in advance, and make sure you have an idea of the route you are following: any miscalculation might cause you to be stuck at a bus stop in the middle of nowhere for several hours! For example, in the winter season the bus stops along the Atlanterhavsvegen only twice during the whole day: missing the first bus means waiting for several hours for the second one (best-case scenario), while if the one you miss is the second and last bus of the day you’re potentially stuck there indefinitely (worst-case scenario, clearly). 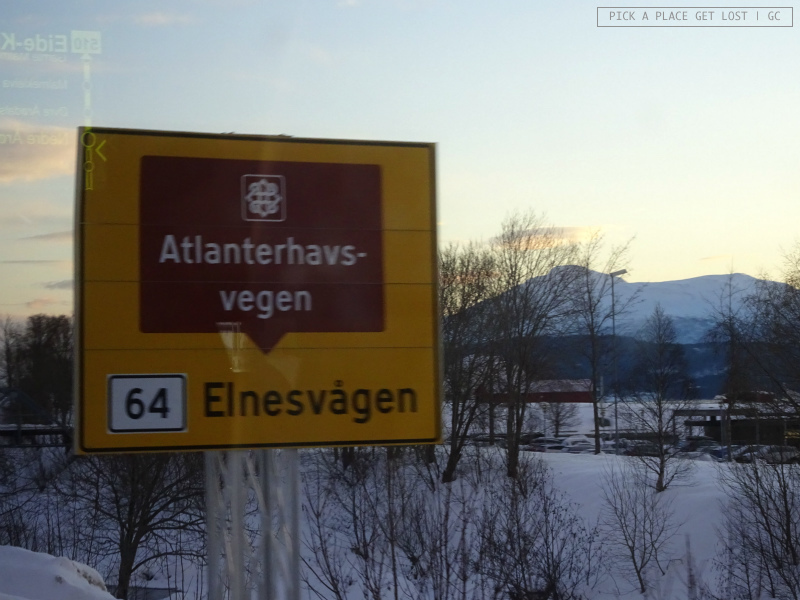 I would recommend this tour to all those who want to see the Atlanterhavsvegen, but don’t want or have time to rent their own car, or do not feel safe driving around in the winter season. 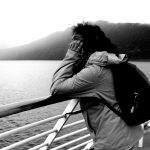 Because I booked the tour last minute, and because, once in Molde, I fell asleep shortly after dinner due to lack of sleep from the previous night, I didn’t manage to look up extra info on the Atlantic Road or Kristiansund in advance. As a result, I was super unprepared. But it was okay: you can’t always be prepared anyway, and sometimes improvisation is great. 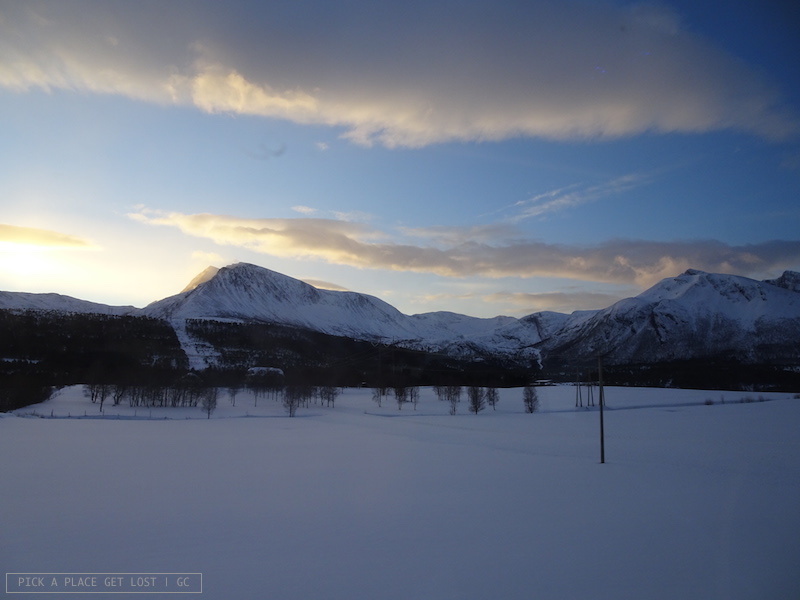 When the (first) bus left Molde station, the sun was just about to rise above the horizon, and the clouds cast their orange, yellow and pink hues on the white snow all around. 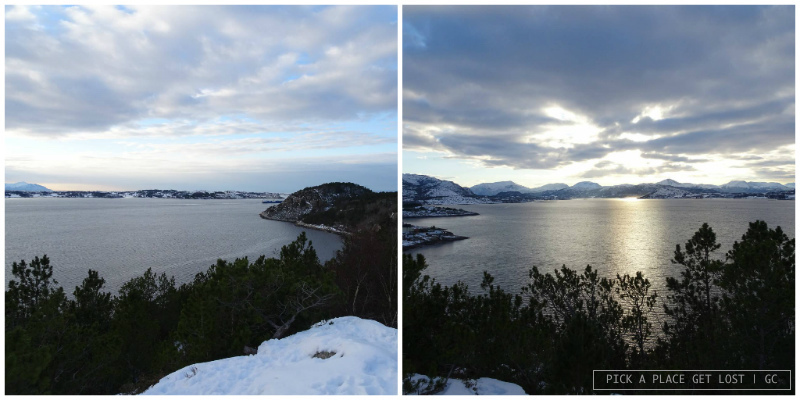 From Molde it takes a while to get to the Atlantic Road, but the view is truly mesmerising all the way. 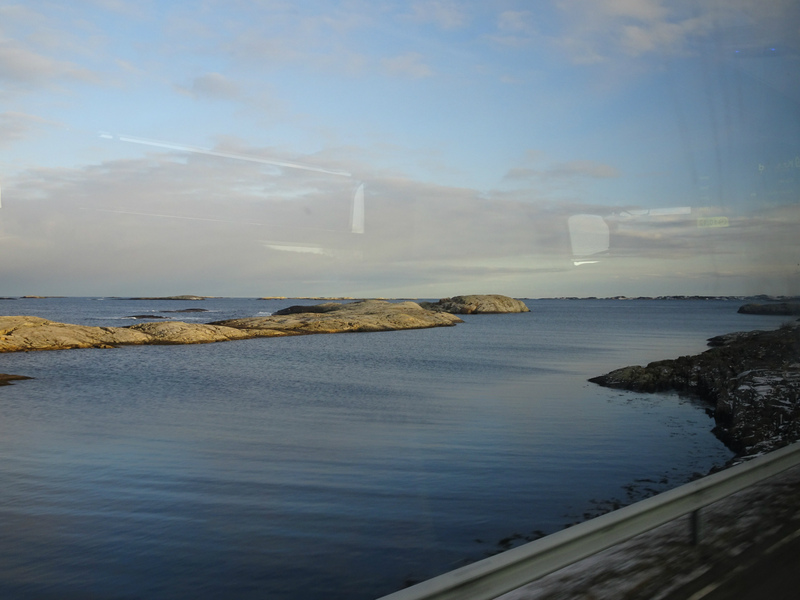 When the first bus reached its final stop (Kårvåg), I got off, and got on the bus that was waiting there, which was headed for Kristiansund. 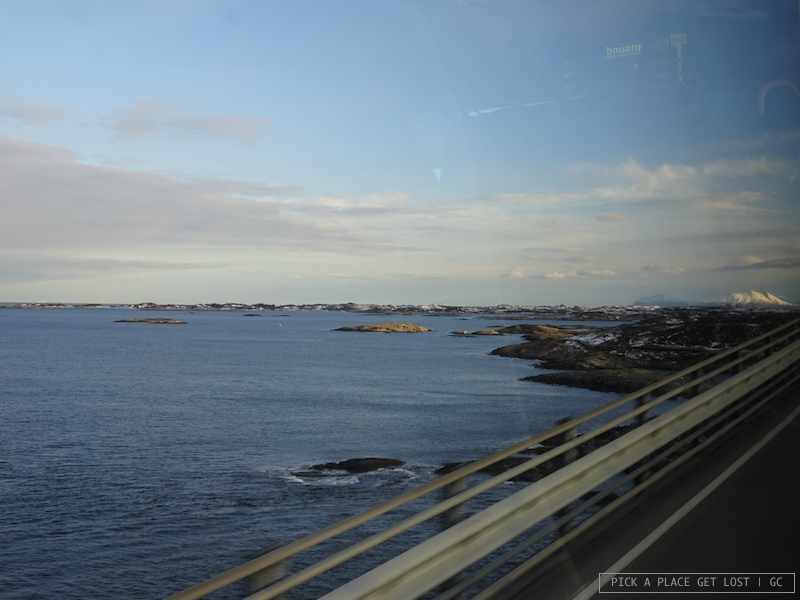 Not long after the bus drive resumed, I realised we were approaching the Atlantic Road. Luckily enough, the bus was almost empty, so I could move freely between window seats on opposite sides of the bus, and take as many photos as necessary! The Atlanterhavsvegen takes the notion of ‘scenic’ to a whole new level. 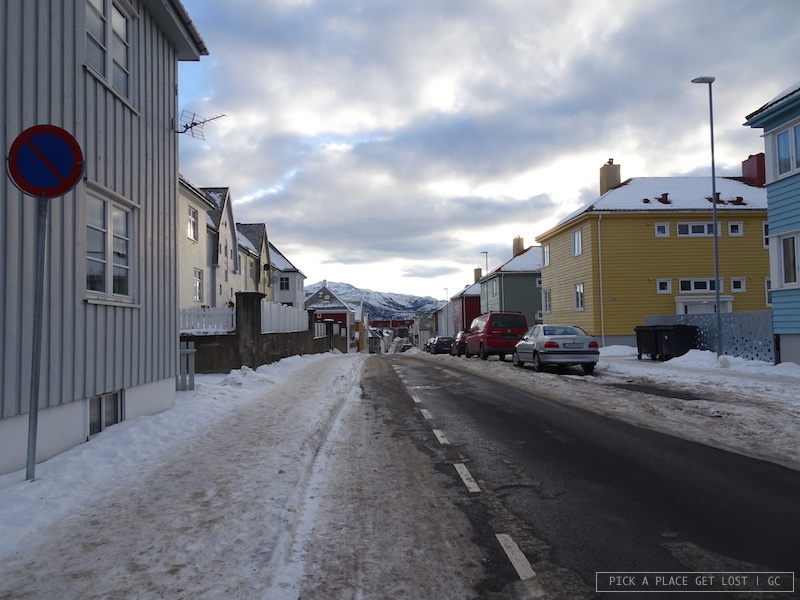 The road stretches between the fishing village of Bud and Kristiansund. Its most famous and spectacular stretch, around 8.3 km long, connects the mainland with the island of Averøy. It curves elegantly yet dramatically along a coastal landscape largely consisting of bare rocks and tiny islets. Two of its most famous spots are Eldhusøya and Storseisundet. The former is known for its suspended walkway, which consists of floating grids that follow the perimeter of the islet. I can only imagine how crowded it must be in the summer months! Fyi, the site also has a café and toilets. The latter is an impossibly high curved bridge which, if you see it, you won’t be surprised to hear that the Atlantic Road was celebrated as an engineering masterpiece. 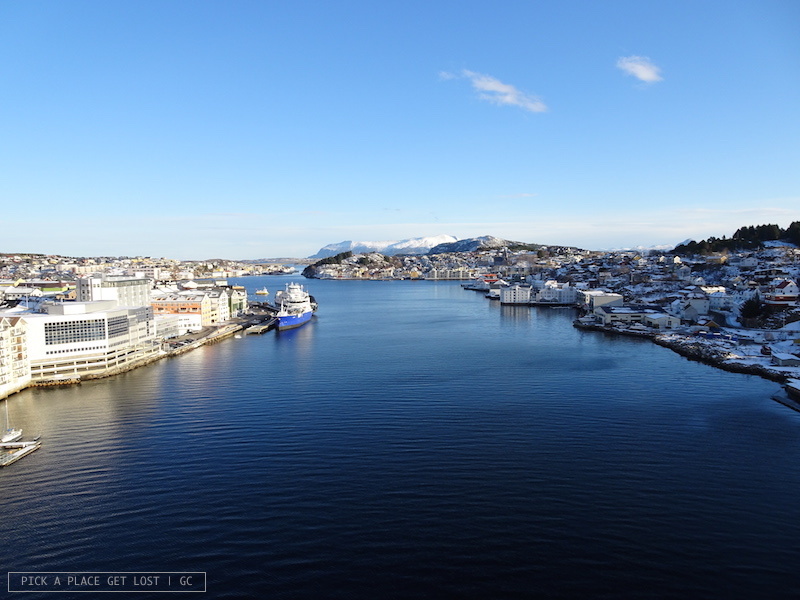 When I got off at Kristiansund bus terminal, the sun was high and the sky was blue. I could hardly believe my eyes. Not having any guides or maps on my hands, I thought I’d rely solely on Google Maps. I had food, water, and four whole hours to wander about the city: I was good to go. It took me a while to figure out the urban landscape of the city, which is objectively rather peculiar. 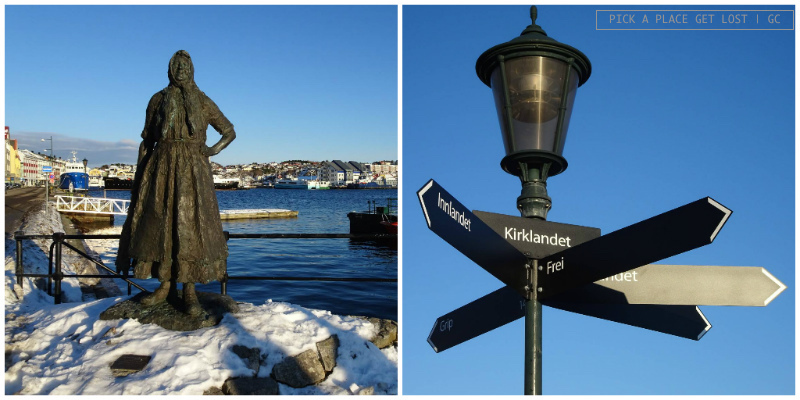 Yes, because Kristiansund sits on four main islands: Nordlandet, Innlandet, Kirklandet and Frei. Plus several smaller islands and islets all around, that is. 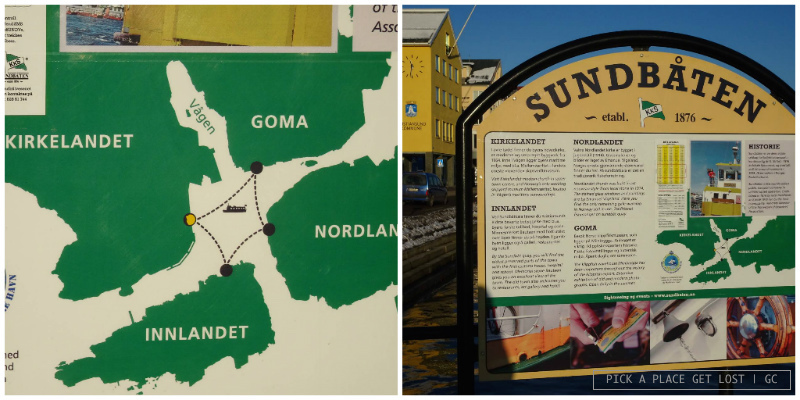 The four larger islands are connected with each other by ferry (the yellow Sundbåten) and, partly, by bridges. 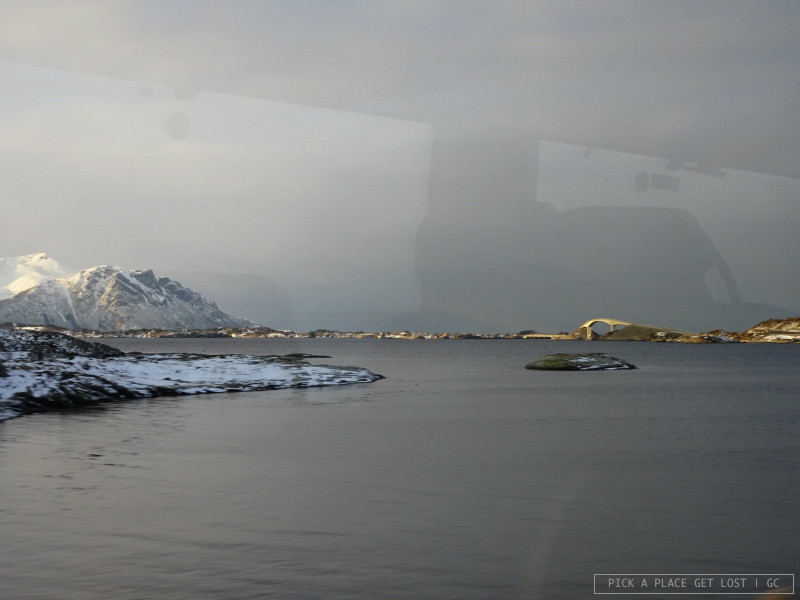 It wasn’t long before I realised that I wouldn’t have enough time to set foot on all four islands, so I thought I’d be happy to focus on two of them: Kirklandet (where the bus terminal is also located) and Innlandet, which is where I headed straight after getting off the bus. I headed down the main street, past the ferry stop, and toward the bridge. The bridge has a pavement on both sides, so you can easily cross it on foot. What is more, it offers great views of the city, the sea and the mountains, so go for it! Then I just kept walking through Innlandet for as long as I could, till I reached a point at the end of the island, from which I could see Nordlandet in front of me, its brick-walled church standing out in the urban landscape. When I realised I wouldn’t be able to visit all four islands that made up the city, I resolved to take a good look from above. 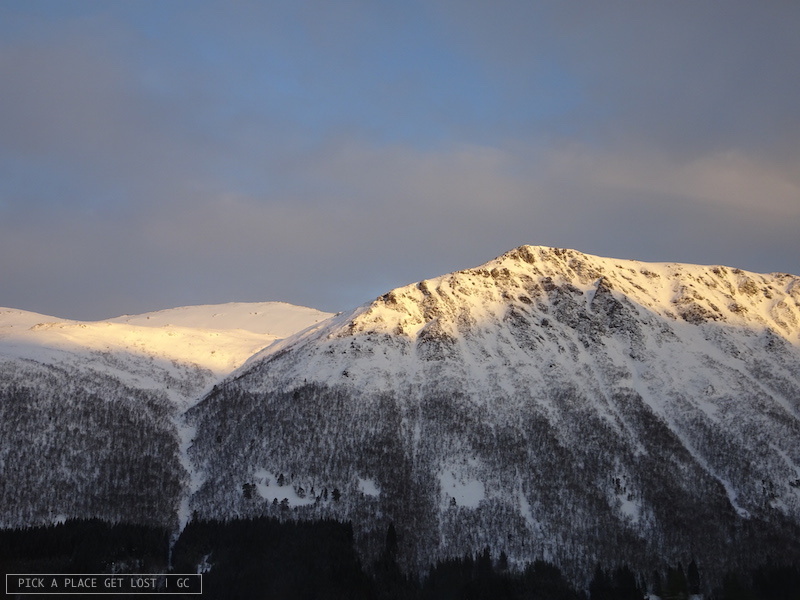 In order to do that, I had to head back to Kirklandet, and up to its highest point, Varden. On my way back to Kirklandet, though, something happened. I hate getting personal on the blog, but this one time there’s no way for me to phrase it without getting personal, so bear with me for that. While crossing the bridge I casually glanced upwards. I noticed a large brown bird flying across the (still) blue afternoon sky. It was moving quite slowly, as if scanning the surface below in search of something. It didn’t take me long to realise what it was. It took me much longer to believe that it was it. 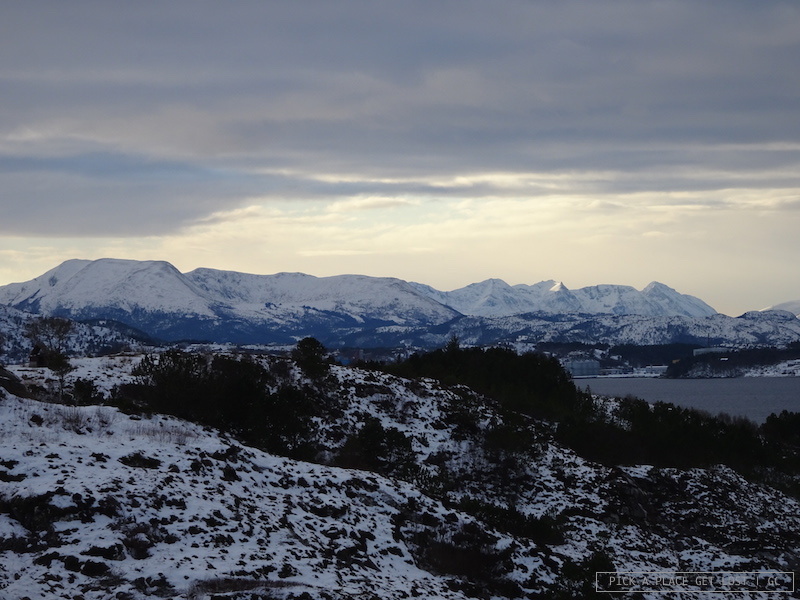 I had only glimpsed a sea eagle once when I was in Bodø, and I joined the Arctic Walk organised by Stella Polaris around beaches north of the city. It only lasted a few seconds, though: it was there, and then it wasn’t. It was far away from us, and it flew across the sky too quickly for us to get a good look. This time it was different. The sea eagle was there, and it didn’t go away. 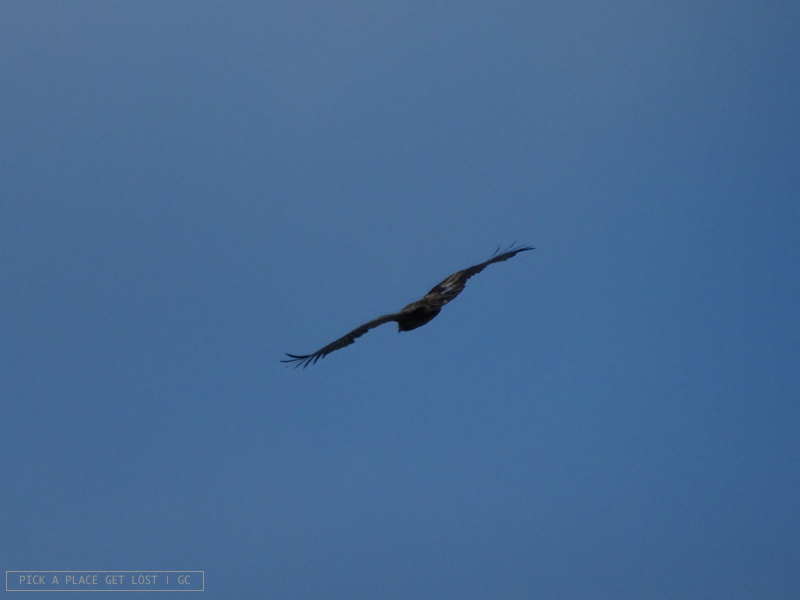 It kept flying in circles above the bridge and its surroundings. It was so close, and it moved slowly enough for me to take photos. It had such unimaginably large wings. There was complete silence and no one around: no cars driving past, and no pedestrians on the bridge. Where is everyone?? Why isn’t everyone here to see this? ?, I asked myself. 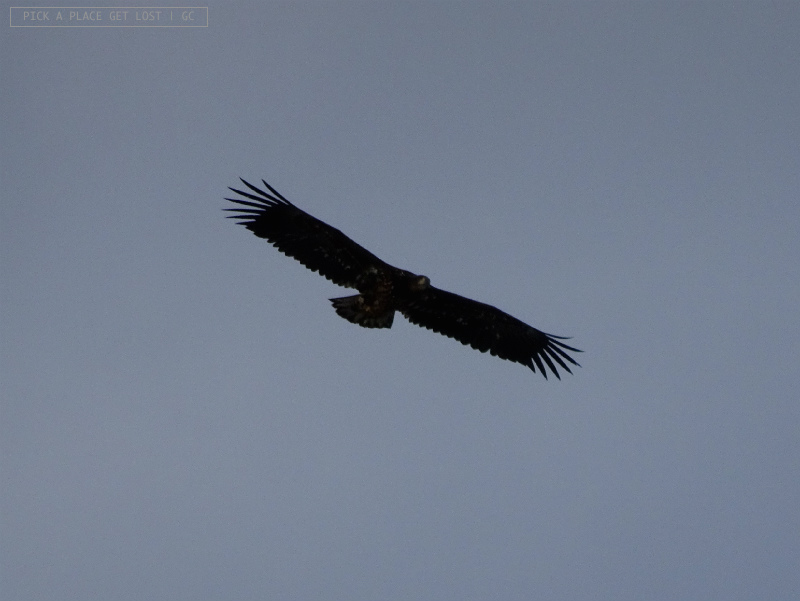 Then an eaglet appeared out of nowhere, and the two eagles were flying about right above my head. Then the eaglet left, and the adult eagle was alone again. I wanted to scream with joy and jump all over the place. Instead, I stood motionless and silently took photos, my hands almost shaking because I simply could not believe my eyes. I stood like that for a while, till the sea eagle disappeared in the distance, and did not come back. I don’t remember being as mesmerised in my life. It was one of the most beautiful, most touching sights I’ve ever experienced. I was this close to not even mentioning at all here on the blog, so ‘jealous’ I am of those few minutes on that bridge. But then I also thought that I couldn’t not share such indescribable beauty, so here it is. 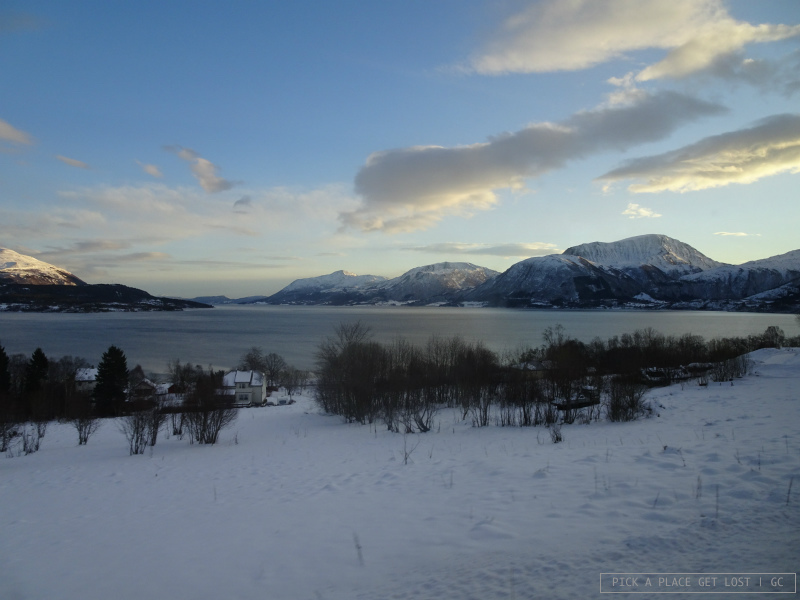 Now, let’s really talk about Varden (not to be confused with the Varden area in Molde), and how to get there. You can either walk up Tollinspektør Flors gate (which then changes into Vuggaveien and, if you keep to the right, takes you straight to Varden), or head inland straight from the pier, and get it completely wrong as I did, but eventually make it to Varden anyway! If you choose the latter, walk up Magnus Blikstads gate, turn left into Langveien, and then right into Johan P. Clausens gate. You will reach the old reservoir area, now a natural recreation area with three small lakes (Vandamman, Gravemdammen and Svanedammen), and plenty of trails for you to hike and wander about. It’s one of those places that make you feel like you’re miles from everything urban, when in fact you’re literally a few steps off the city centre. 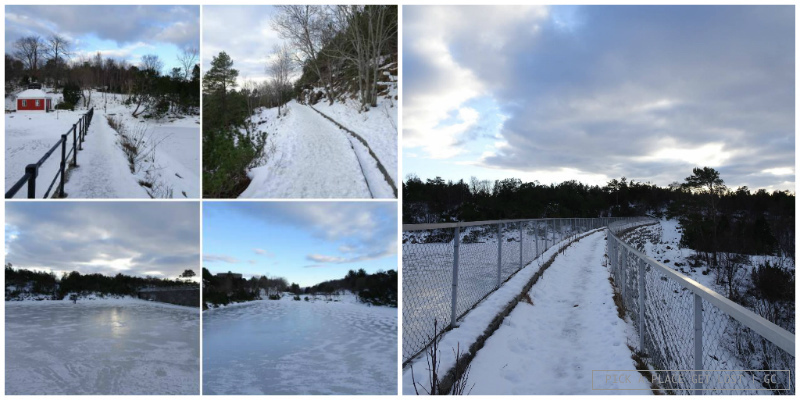 It kind of reminded me a bit of Baneheia, in Kristiansand. I did eventually also make it to Varden. 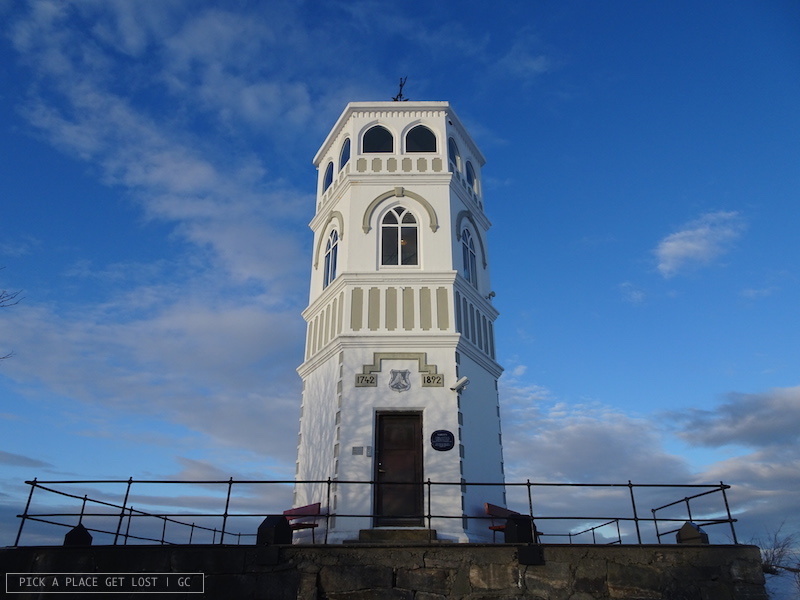 The Varden watchtower was used in the old days to catch sight of ships (in times of both war and peace), and today serves as privileged viewing spot over the city. 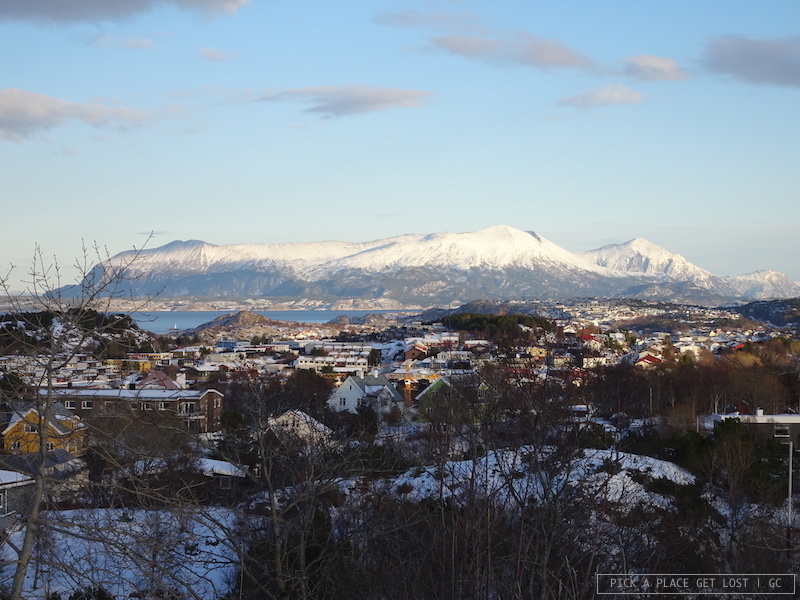 It offers a stunning 360-degree view over the city, the fjord, and the mountains. When I got there the sunset light was already casting a warm, golden light on all things around. It was so truly beautiful up there. But I did have to drag myself away at some point, or the bus to Molde would leave without me. 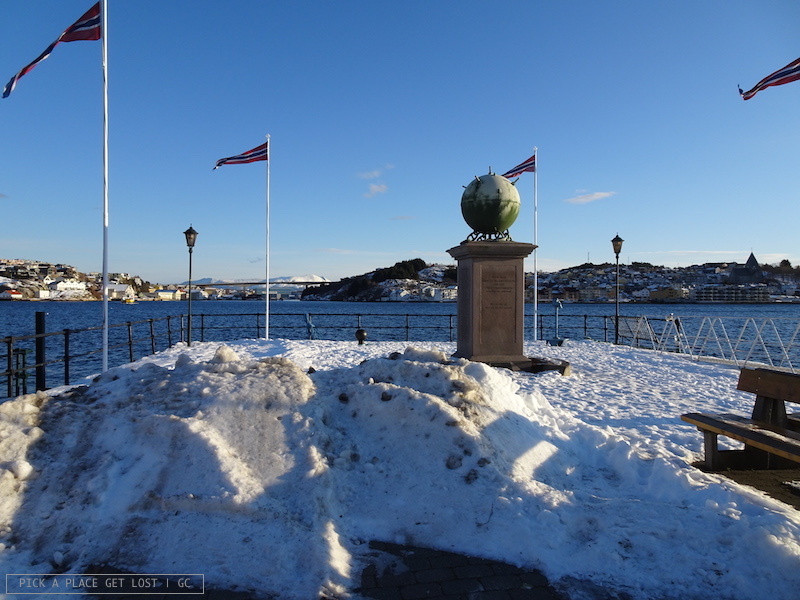 Kristiansund was a surprise. Sure, it was on my to-do list for the day, so I already knew I’d make it there. But the way those few hours I spent there unfolded made the visit even more unique: the bright sun, the deep blue sea, the island hopping I did not expect, the early sunset, the silent cityscape from the tower top, and the sea eagle. Being there once made me want to be there again. Isn’t that beautiful when that happens? 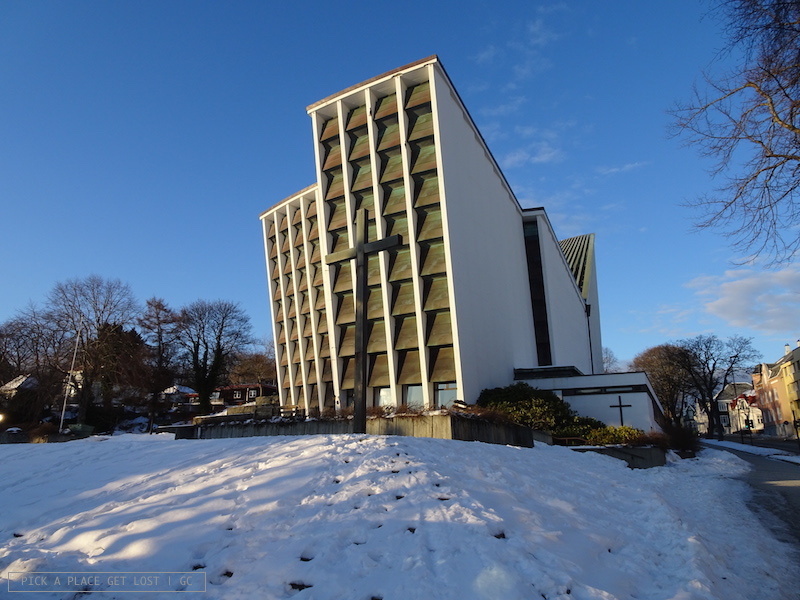 This entry was posted in Norway, Norway 2019 and tagged atlanterhavsvegen, atlantic road, bus tour, fram, kristiansund, molde, møre og romsdal, norway by Giorgia. Bookmark the permalink.